Panda Magic is the latest online slot game brought to you by Real Time Gaming in there continued commitment to releasing one game a month during 2016. The game is a great addition to the current ones on offer and gives players the opportunity to win with a huge betting range that caters for fans of all abilities and bet sizes. The game is a 5 reel all ways pay, with an impressive 1024 combinations to win, it is a non-progressive jackpot paying out 2,000x the stake. The theme of the slot is the orient with many interesting symbols for players to discover. Set under the mystique of a bright moon and shining stars the various symbols on offer add to the magical Eastern feel of the overall positive feel for gamers. Symbols include the Panda Magic logo, magic ticket, candle, purple wizard’s hat, owl and crystal ball to name but a few. The wild symbol is the Panda Magic icon which replaces all others to finish off a winning payline, the game is an all pays wins, making it very user friendly. To get started there is no need to choose lines simply click and play to take advantage of this feature. Autoplay also allows for a pre-determined number of spins, to stop this simply select the stop auto button, this enable players to be as involved or detached as they like within the game. 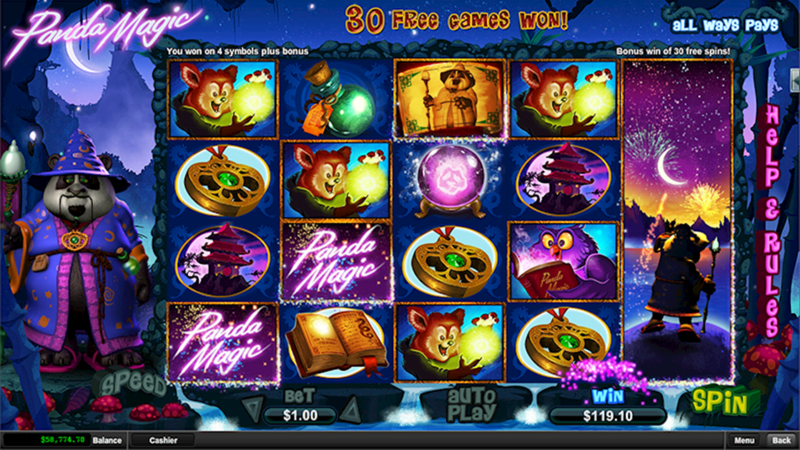 Panda Magic is a feature filled game that is sure to keep slot fans who have been eagerly awaiting the latest release happy. Not only is it packed with interesting symbols and huge payouts, the gameplay offers a wonderful experience for expert and new slot fans alike.